Yummy, without the fat of deep frying! Scrub potatoes or peel potatoes (only you know how fussy your gang is, grownups love the skin on); cut into wedges. Toss with oil and 1/4 tsp (1 mL) each of the salt and pepper; place on large, foil-lined baking pan. Bake in at 400 for 30 minutes. Turn and bake for 10 minutes longer or until crisp and golden outside and tender inside; remove from oven For a dipping sauce, mix equal amounts low-fat mayo and sweet relish for a homemade, kid-friendly tartar sauce. Oven Crunch Fish n’ Chips – Yummy, without the fat of deep frying! 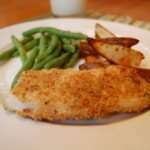 – Potatoes (Use large, baking potatoes, even the ones wrapped in foil are good), Vegetable Oil, Salt, Pepper, Halibut (or Haddock fillets (1 lb/500 g total)), Corn Flake Crumbs (or Breadcrumbs), All-purpose Flour, Italian Herb (seasoning), Lemon Zest, Egg, Milk, – Scrub potatoes or peel potatoes (only you know how fussy your gang is, grownups love the skin on); cut into wedges. Toss with oil and 1/4 tsp (1 mL) each of the salt and pepper; place on large, foil-lined baking pan. Bake in at 400 for 30 minutes. Turn and bake for 10 minutes longer or until crisp and golden outside and tender inside; remove from oven For a dipping sauce, mix equal amounts low-fat mayo and sweet relish for a homemade, kid-friendly tartar sauce.